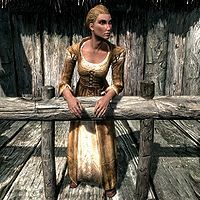 Ingrid is a Nord food vendor who lives in Helgen at the start of the game. During the first scenes she shouts "Death to the Stormcloaks!" right after a Stormcloak rebel is executed. She is killed when Alduin destroys the city. She wears a belted tunic with a pair of boots, and carries an iron dagger. This page was last modified on 25 December 2015, at 12:42.